We are firmly in the ranks of dystopian future fiction here, but forget the dusty, shattered visions of other authors; this is a world that has dragged itself out of murk (highly polluted areas sealed off, the population shifted north following atmospheric change) into a liveable future. The cost for this is control; control over each person’s life, and limited freedoms. Large corporations now run the western bloc, with equally totalitarian, although non-capitalist, enforcement over eastern states. Naturally, there is an active trade in spying and watchful paranoia existing between territories. In the west, among the experimental farms, a respected wheat geneticist makes a terrible discovery: stem rust, a hungry, indiscriminate blight that could spell the end of all the new strains of wheat currently being grown in all of what remains of Earth’s viable fields. When his suggestion of altruistic research to save mankind marks him as a wanted man by the corporation, the geneticist goes underground, joining a band of guerrilla environmentalist-weathermen. Predicting the unstable and potentially crop-destroying weather accurately has become a desirable political power, so when a high-rated weather scientist goes off-message, he is also forced into hiding. Dworkin’s main dystopian indictment is of corporate greed. Compare the ‘voice’ of the blight itself that Dworkin lets us in on; uncaring of right or wrong, with a drive to thrive and breed; it might be seen as evil by the humans struggling under its mantle, but evil really requires conscious thought. The corporations and those in power have a choice; and yet choose to extort all profit that they can. In the face of this, a natural blight that cares nothing for—would not even understand—power or financial gain, seems purer; part of a greater, more powerful picture of natural change and survival. Dworkin presents the great leveller; in dire straits, all that was thought to be ‘important’ is simply petty scrabbling on the face of a larger picture. For in this brave new world, there is still control to be grabbed, but now it is in the fields of science, where holding aces of weather fronts and seed gene copyright makes all the difference between life and death for hundreds of thousands of humans. Dworkin crafts an intelligent and deeply pertinent ecological thriller that reads as disturbingly possible. Damage to the environment and weather changes are a recognisable fact right now; horrific, grinding wars that spell an end of times feel very close to hand as Eastern Europe and the Middle East explode in bloody violence day after day in our news reports. Globally, the beginnings of her corporate-controlled gene giants are already in place, making headlines for commodifying seed supply. Frighteningly, apparently 82% of the commercial seed market is already controlled by these businesses (ETC Group, 2008). Like the predictions of Orwell’s 1984—state control of individual freedoms and information, close monitoring of public activity—Dworkin is writing a future that could very well be on the cards. The power of good speculative fiction is to bring uncomfortable truths to light. It can warn, examine, and to educate the reader. And in the tradition of such parables, we are offered a glimmer of hope—a different way of behaving. 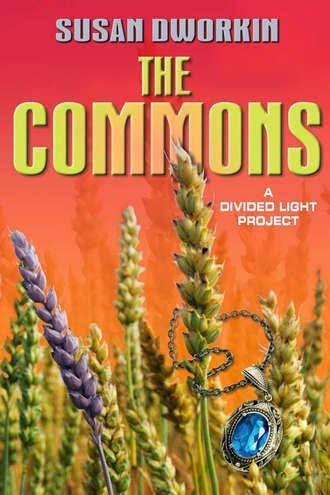 The title says it all—the commons. The mass of ordinary people. For when ‘the commons’ is quoted, it is for their capacity for revolution. The greater mass of humanity has, we are frequently reminded, the ability to force change at higher levels, beginning with the realisation of the commons that they have that power! Even if, as in Dworkin’s version of events, the change is an underground rebel movement, it demonstrates the variety and contrariness of human spirit; the capacity to think for oneself, which makes us, as a whole, so hard to define, and in the long run, impossible to control absolutely. By the end of this tale, although authority scrambles to maintain its grip—and seems, at least nominally, to do so—cracks have appeared. Failed corporate-dispensed pesticides are flummoxed by a mutated form of the blight. And the environmentally-friendly rebel group sends out to any and all farmers—gratis—packets of naturally blight-resistant wheat variant seed. It arrives on the wings of bird messengers, backed up by leaflets on which accurate weather reports give the best days for planting, nurturing and harvesting the new crop. This rebel group is not about fighting, restarting a cycle of violence and death, but comes quietly, changing from the ground up—literally. This is a rebellion of the mind, of the will. Dworkin is giving us an alternative for the future: rebellion that will see authoritarian bullying collapse under its own weight as the rug is cannily whipped from under its feet. What replaces it will be up to the commons themselves. The crop freely dispersed is a metaphor for this change. It is a product of research and intensive detective work by co-operation of individuals across borders and boundaries. The common good is only achievable by opening oneself up to others, to possibility, and to change that is far bigger than any one person. The story is clear: we are better together—and when the chips are down, we are all in it together—so get working! There is not just power in group decisions, for it begins in the power of individual choice as a motivator of change. For Dworkin’s tale, this comes across most clearly in the coming-of-age of Lizzie. A girl from a wealthy farming family, she wanted to become a pop star and live the comfortable life. But when it becomes clear that her grandmother is involved with non-corporate elements, Lizzie will have to make a choice: follow the harder route of the woman she admires, or follow the proscribed route of the easy life. Music itself becomes her rebellious act: singing coded songs of support to rebels and increasingly desperate farmers. I am strongly reminded of a Ukrainian pop star who stood up and sang traditional, national songs at a rally in the Ukraine not so long ago. When asked why she risked her life to do so, a target for snipers in a troubled region, she said she simply had to—for her fellow countrymen to give them heart, and because if she did not, she would not be able to look herself in the face. Similarly, Lizzie makes her choice based on a bigger vision of what her country needs; not what it is being told it should do. The harder path is the moral one. Morality as something hard to work for is a common trope across many variants of narrative archetype, and this is, at heart, a very moral book. Our future is salvageable, but only if we grow up and become moral beings. Lizzie’s journey of growth comes from realising her inevitable part in a bigger picture, and not just succumbing to an infantile condition of unheeding, selfish fulfilment. Growing up, becoming moral, means realising the common cause where the cost is one’s own comfort, in getting the job done, not standing back and spending the comfort of others sent to do one’s bidding instead. In fine Trekkie tradition, the needs of the many outweigh the needs of the few. Don’t be alarmed, this is not heavy TOME of banging ethical didactism. This is a bouncing, exciting adventure of a novel. With sneaked meetings, coded messages, colourful landscapes, chases, escapes and a cast of vivid characters, it is a pleasure to read as well as an intellectual treat. Dworkin handles heavy themes with consummate skill, and while there is a view that the wheel of human history turns but does not essentially change, an indictment of human folly, there is the hope of human greatness as a counterbalance. At least the wheel can keep turning, and not grind to a total halt. It is a humane book, willing to allow for a future for humanity; different, but doable. And all is not doom and gloom: we may end our world, but we can begin it, too. There are familiar ideas in here about human folly but as a philosophically and psychologically-savvy warning, it is yet upbeat. This parable has hope; a significant belief in the better elements of our race, and our race’s ability to manifest those amongst the blight of selfish fear.